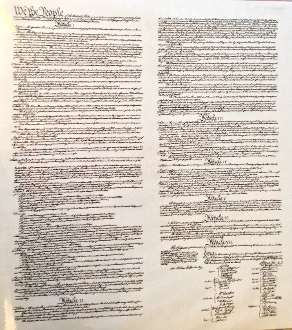 "Dedicated To Remembering Our Country's Greatness"
We have assembled the first 4 pages of the constitution in a large "all in one" format. This lends itself to being a more attractive type of poster, with the signature portion large enough to be more easily copied. We make this in white so it blends in with the velum overly used for the "resigning". Copyright © 2011-2019 Celebrate Our Country, Inc. All rights reserved.